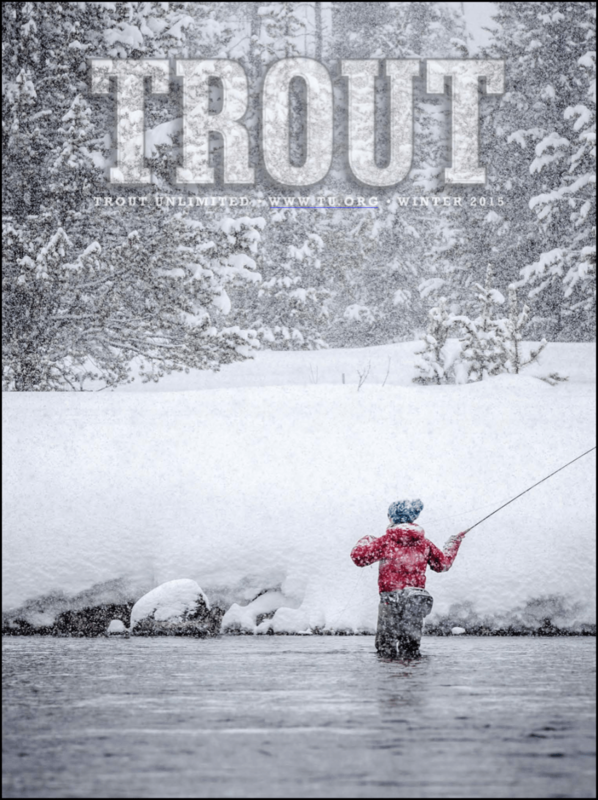 The new issue of TROUT magazine is hot off the press. I’m thrilled and humbled to have landed the cover image. This is my second cover with TROUT Magazine as a photographer and I couldn’t be more pleased. You can get your copy a few different ways. Often your local angling shop will have them or you can get it free with your Trout Unlimited membership. I am member of Trout Unlimited. TU’s conservation and restoration work in and around my home waters is vital for the survival of an ecosystem and native species such as the Cutthroat Trout. For that I am very thankful and one of the reasons I donate. What’s your reason? A blustery winters day might seen insignificant to non-anglers, however, in countless areas such as the Henry’s Fork River it can cause quite a stir amongst the fish relishing a healthy hatch. Laura Jenkins casting to sipping wild rainbow trout in the solitude of an average winters day in the mighty Yellowstone caldera. The new 2015 Trout Unlimited Calendar is out. I’m very happy to see my image for the month of January. What a great way to start out the New Year! I am member of Trout Unlimited. TU’s conservation and restoration work in and around my home waters is vital for the survival of an ecosystem and native species such as the Cutthroat Trout. For that I am very thankful. This image is a perfect example of what can be accomplished with what some would call a “mediocre” camera, I say its just less expensive. I captured this image of my buddy, Scott Dickey, on freezing morning on the Middle Section of the renowned Provo River, with a *gasp* less expensive camera. I cost a few hundred bucks is all, which is awfully cheap in the camera World. I didn’t have all the latest and greatest in camera equipment: no high-end DSLR, no prime ‘L” glass, no fancy filters, over priced tripod sticks or expensive ball-heads. I just had a camera, superb scenery and crazy friends willing to dawn patrol in sub-zero temps for a few images. Does high-end gear make it easier for me to get my day-to-day job done, of course it does. But you don’t need all of that to create and capture a great image. Check out some of Scott’s adventures and flies. A few of these are staples in my box!